The Lil Divas and I LOVE reading books together and I'm enjoying sharing book lists with you of our favorite reads. Today, I have some chapter books for you to enjoy that are just in time for Valentine's Day. Nancy Drew and the Clue Crew #12: Valentine's Day Secret - Nancy's best friends Bess and George are mad at each other. When the girls are making their own stuffed animals someone slips a mean valentine into Bess' animal's pocket and she blames George. The girls uncover who the valentine came from and end up making up. This was a fun read for my daughter who is usually in a squabble of some sort with her sister. Cam Jansen #25: The Valentine Baby Mystery - Cam's mom is about to give birth so Cam, her best friend Eric and his mom rush to the hospital. Of course a mystery presents itself when Eric's mother finds her purse missing. The Oldest Diva enjoyed Cam's baby brother and sister being born in this book. We are huge Cam fans so it was nice to learn more about her family. Nate the Great and the Mushy Valentine - Here's one that will appeal to the boys (and the girls)! The Oldest Diva enjoys the color illustrations in these books and they are quick, easy reads that are perfect for those just getting into chapter books. In this book, Nate's dog Sludge gets a secret valentine and Nate sets out to uncover who it's from. My daughter enjoys trying to figure out the mysteries before Nate does. There is always just enough twists that it's not completely obvious but if you pay attention to the clues - you can figure it out. 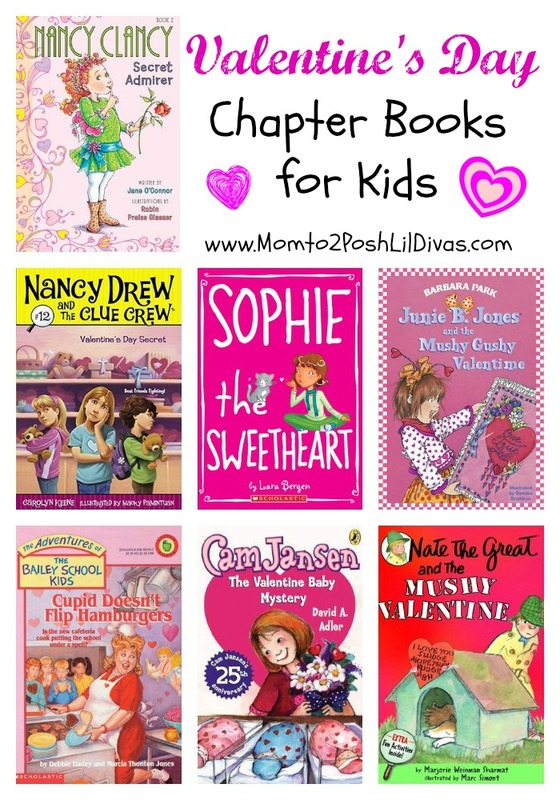 Fancy Nancy: Nancy Clancy, Secret Admirer - We have been Fancy Nancy fans for years and it's wonderful that the series is growing with my daughters! We are so excited about these chapter books. This is the 2nd one starring an older Nancy Clancy. In this book, Nancy plots to have her baby sitter and guitar teacher fall in love. The adventure here is cute as Nancy learns that matchmaking is hard and things don't always work out as planned. Junie B. Jones and the Mushy Gushy Valentine - Junie B. gets a valentine from a secret admirer and is determined to find out who it's from. Junie B. is her usual entertaining self - my daughter gets a kick out of her antics and thoughts. Maybe because Junie B. gets to do and say things she isn't allowed to? This was a fun read and Junie is pretty funny as she tries to figure out which boy left her the valentine. She does finally uncover who her secret valentine is - my lips are sealed. Sophie the Sweetheart - Sophie was new to us but I decided to pick up this book and was glad I did. Sophie is quirky and apparently always in search of the "perfect" nickname. In this book, she decides that Sophie the Sweetheart just might be it. In order to be a sweetheart she has to be super nice even to those that aren't so nice to her. This wasn't a typical Valentine's Day themed read but it was sweet and it introduced us to a character and a series that we will surely be reading more of in the future. Adventures of the Bailey School Kids #12: Cupid Doesn't Flip Hamburgers - This was the first book we read in this particular series. It was popular with my 3rd grade students when I was teaching that particular grade so I decided to hive it a try with the Oldest Diva. The characters aren't "typical" they may or may not be monsters, etc which makes this a different and fun read for kids. Is the cook really cupid? Strange things are happening and everyone is being overly nice to each other - even the mean kids. I won't give the book away but I will say we all enjoyed it. Are there any early chapter books that you would add to this Valentine's Day themed reading list? We love the Fancy Nancy picture books. It'll be fun to read the chapter books, too. The Junie B Jones chapter book made us laugh! Thanks for such a complete list. I know it took a lot of research to compile!!! Thanks for sharing on the After School Link-Up! I am featuring your post this week on Parent Teach Play: http://www.parentteachplay.com/great-book-lists-for-kids Please feel free to stop by and grab a featured button. Off to pin. Thanks again! !